Home/Residential Elevators/I don’t care if I ever go up and down those stairs again! I have always said that 30-40 years ago, a dishwasher was a luxury appliance for the home and now you cannot buy a home without at least one or possibly two of them. The residential elevator is becoming just like that. 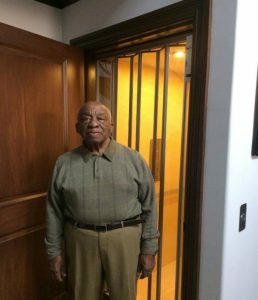 Recently, Precision Lift Industries was contact by Alex to talk about a residential elevator in his home, and after much discussion on size and colors, there was an agreed upon fit for he and his wife being able to stay in their home seen all their children grow up and go off to college from. A local contractor that was brought in to do the necessary work that was needed before the residential elevator could be installed. After being at the home for a couple of days and talking with Alex and his wonderful wife, I found out Alex was a former Tuskegee Airman trainee, and he went on to tell me many other things about his long life. However, one of the most rewarding remarks that Alex made was after he rode his residential elevator up and down the very first time was when he looked at the stairs and said “I don’t care if I ever go up and down those stairs again”.